So I'm reading Paul Foster Case's The Tarot: A Key to the Wisdom of the Ages. At first I was very excited because it seemed to be a bit of a bridge between my past spirituality and my present. I was excited about the numerology and the deeper meanings of things and the insights into the Old and New Testament, which I know very well. I was renewed by the idea of a new perspective on cosmic workings, and as I did side research on the Builders of the Adytum, I was encouraged to see their statement in one place that it all boils down to love. But as I read more and as I sorted through the meanings of 0, 1, 2, etc and went back and forth, and diagrammed and charted, I began to grow tired. When I wanted to express my progress this morning, I decided to draw a card and take a picture of it, attach it to my post and see how it applied. 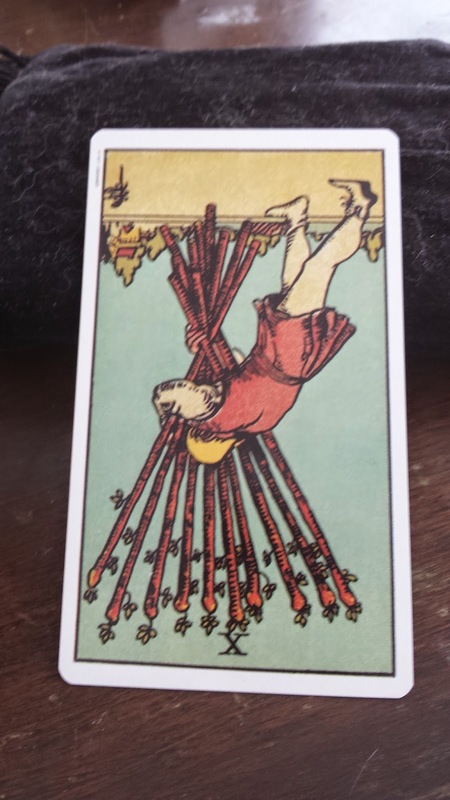 Ten of Wands Reversed. A man has been on a long journey and has gathered many materials, knowledge, etc. and is heading back to town to put it all together. He is tired and weary from his travels and the burdens he carries. When he gets back to town and starts putting things together, he realizes that he only needed a small portion of the things he had gathered. In weariness and discouragement, he lays down and takes a long nap, pondering the time he has spent and wishing he had simply realized what had been in front of him all this time. As much as I enjoy mysteries and puzzles, my initial take on Tarot cards was very simple: a tool that mixes both psychology and a bit of the unknown that when used properly, is a very encouraging tool to think through situations and gain new perspectives. I will continue to read Case's book, but as I go forward my purpose is simply to glean new insights into Tarot, to be renewed in some ideals, and to add new perspectives on the cosmos as food for thought. Esoteric knowledge is interesting and mysterious, but I always have been and am more so now convinced that answers to life are not hidden away somewhere for an elite few, but are right in front of our eyes and are available to all regardless of intellectual capacity. But we all find those truths in different ways, and I see validity in a person's heart being compelled to seek out truths that are hidden and to find them shrouded in mystery. The universe is an infinite and diverse place and the people that inhabit it reflect that diversity.